With the first weekend of the college season officially in the books, we finally have some real data from which we can over-analyze. This is the definition of a small sample size, so it’s silly to put too much stock in one weekend, but it’s also silly to ignore it completely. Each weekend we’ll be highlighting the weekend action and discussing the draft’s statistical risers and fallers. The video above of Louisville outfielder Corey Ray was shot over 3 games in 2015 and captured a lot of swings and misses that were clearly absent this weekend as Ray went off against SIU Edwardsville. Ray put together an impressive weekend line going 6-9, 2B, 2 HR, 7 RBI and 6 SB to give himself a little early separation in a deep outfield class. On the other end of the spectrum, Alec Hansen made his debut on Saturday and it didn’t go as swimmingly as Ray’s. We rolled out Hansen’s scouting report last week an within it, we highlighted Hansen’s need to cut down on his career 5.52 BB/9 ratio. 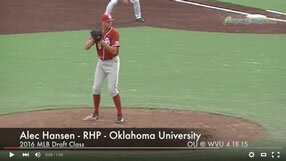 Hansen was reportedly working in the 95-98 mph range with zero command. Hanson took the loss against Northeastern and finished with a line of 1 IP, 1 H, 3 ER, 4 BB, and 1K. Kentucky third basemen JaVon Shelby validated my endorsement if him being a bat to watch for in this class with an 8-12, 4 double, 2 HR weekend. JaVon is the son of 11 year MLB veteran John Shelby, and burst on to my radar when I saw him homer off Vanderbilt first rounders Carson Fulmer and Walker Buehler last year. Another eye popping performance came from Samford outfielder Heath Quinn. Quinn, an unsigned 12th round pick in 2013 (Cleveland) hit for the cycle on Saturday and ended the weekend with 10 hits, 3 HR and 9 RBI. Here’s a look at how some of the other draft prospects faired this weekend. Ian Hamilton RHP Wash. St.
Trey Cobb RHP Oklahoma St.
2B (1), 2 HR (2), 6 SB (6). Sean Murphy C Wright St.